Suppose you want to compute the normalized flow from the acquired data: Flow (FY_201), Temperature (TY_201) and Pressure (PY_201). where Temperature K is the temperature in Kelvin ( that is Temperature C° + 273.16). Normal Pressure will be 1.033 Bar. Note that the available acquired OPC items list on the left of the dialog box with Qualified Name and Short Name. The Short Names (in the screen copy, FY_201, TY_201 and PY_201) are used to make calculation easier to read and edit. 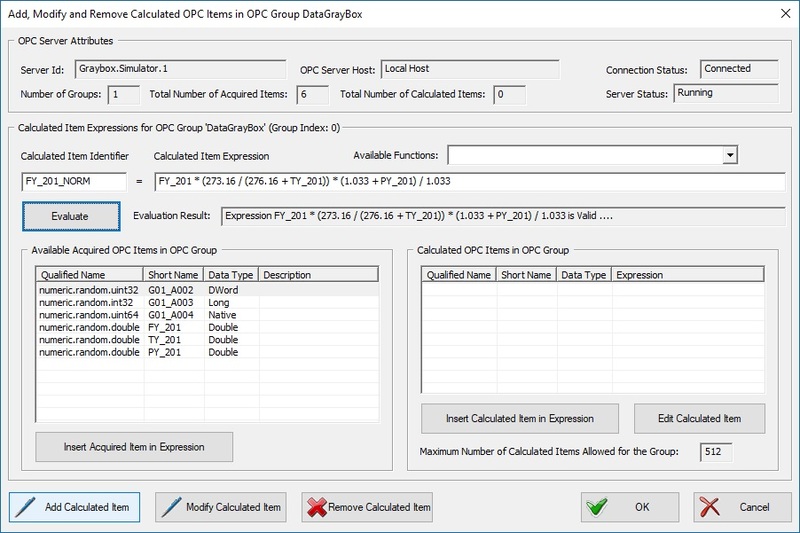 Note: in case of error, Genesis OPC Explorer 3.1 displays the best possible explanation of the expression issue. Click on the 'Add Item' button to Add the Item to the Calculated Item List. 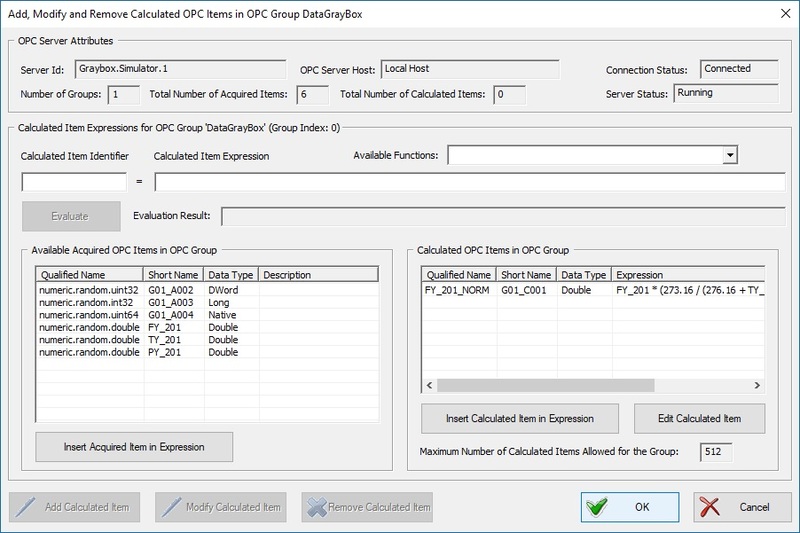 The Dialog Box willl then show the new configuration of the OPC group. 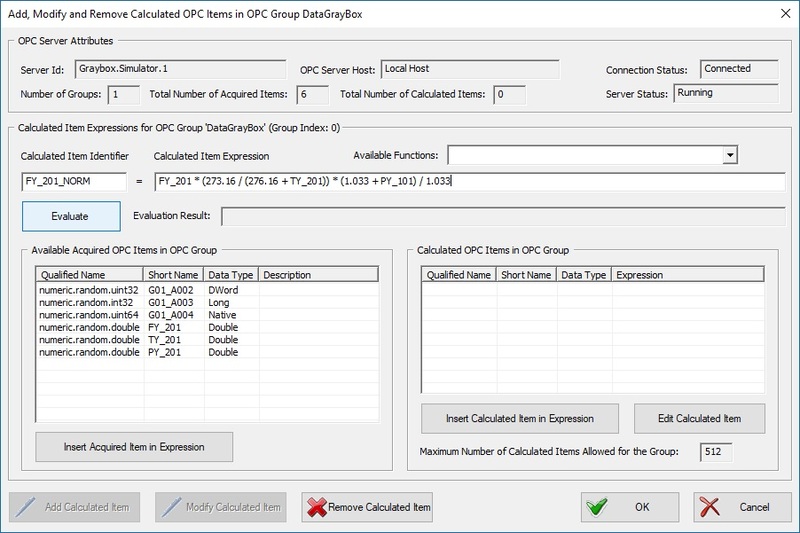 Calculated data can be used in other calculated data expression provided that ....it is computed before !!! Obviously, Indirect calculated items are valid only if intermediary calculated items are already calculated and valid.